Those who were hoping to maintain some semblance of surprise about Star Wars: Episode VII – Dawn Of The Space Pig are doing an excellent job of it by not clicking on any articles with the words “leaked Star Wars set photos” in the headline, thereby taking control of their own destinies, and giving them no reason to blame those who are only feeding the ravenous maw of the fan machine. For everyone else, the Bothan spies of TMZ continue to bring you news of director J.J. Abrams’ quest to return the saga to its practical epic space battle roots. 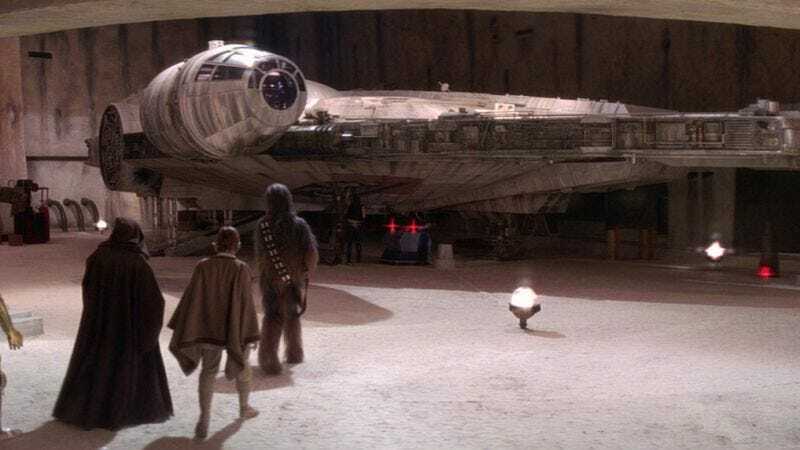 Today they follow up yesterday’s genuine dirt-filled set photos with images of what appear to be an actual, full-scale Millennium Falcon under construction, using actual materials humans could conceivably stand on and touch. (Not you, necessarily, but others.) And seeing the cockpit of the Millennium Falcon again, even in this unfinished form, occupying real-life physical space—alongside what is either an X-Wing or a Z-95 Headhunter, depending on whether you are one of those people who owns a Star Wars: Blueprint book—is enough to provoke pangs of nostalgia in even the most jaded of fans, reminding them of what they loved about the series in the first place. As of press time, George Lucas had already snuck into the warehouse and replaced the Millennium Falcon with a digital one.